OPEN WATER - SeaVax is seen here during open water floatation trials. Please note that this is a small (proof of concept) version of any ocean or river floating dustcart that we hope will be tested on the south coast of England as the project progresses. SeaVax is a selective filtration machine that can be configured to target solid plastics and particles. The machine could also be used in oil spill emergencies, or as a selective fishing vessel. The platform could thus be useful in many ways in the future. Eventual classification will depend on the function and performance of the vessel. 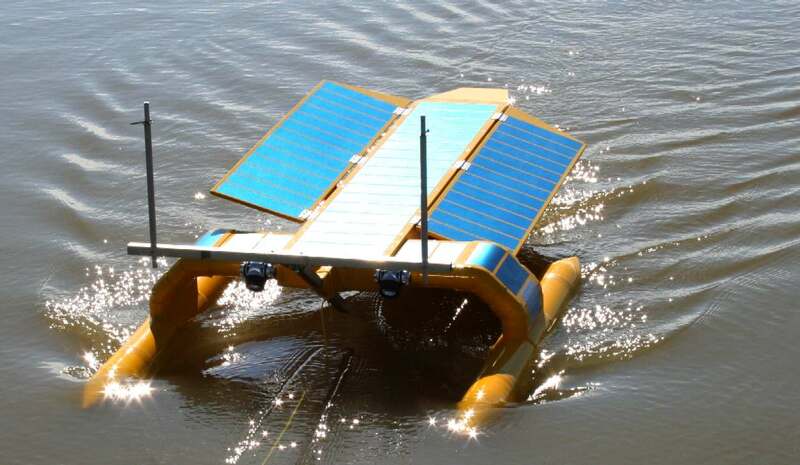 The description and classification of SeaVax and AmphiMax research workhorses and the Elizabeth Swann autonomous solar powered vessels is one of the overall project development targets where no such vessel format currently exists, for which perhaps, funding may be provided by the United Nations, G20 or other long-term beneficiaries. There is no legal requirement for any boat or ship builder to seek classification or to construct a vessel to any particular formula for approval by any classification society. Where a design is pioneering, involving cutting edge innovation like the SeaVax selective filtration or selective fishing vessel, the Cleaner Ocean Foundation considers that it may be appropriate as part of project development to work with the Societies that may eventually assist international ocean cleaning operators, to classify ocean cleaning craft, subject to funding being available for such negotiations and eventual agreements. Hence, this is a goal once any design has reached a stage where a specification for classification may be drawn up - and where such formulation is bound to be an expensive exercise and a burden for a charity involving legal and other experts. Regardless of the considerable additional administrative burdens, at the appropriate juncture COF will seek to generate additional funding to carry out such tasks, or to put in place an alternative that achieves the same. DNV-GL - Claim to be proactive and flexible. They have in the past encouraged innovation in terms of clean energy for shipping. In naval terms, vessels are sometimes launched with a temporary designation and reclassified once their capability is determined. Hull classification varies from country to country. There is no international agreement as to class. A heavily modified or re-purposed ship may receive new symbols and classification, and either retain the hull number or receive a new one. The system of naval symbols has changed a number of times since it was introduced in 1907, and for this reason ships' symbols sometimes change without any physical alterations to a ship. 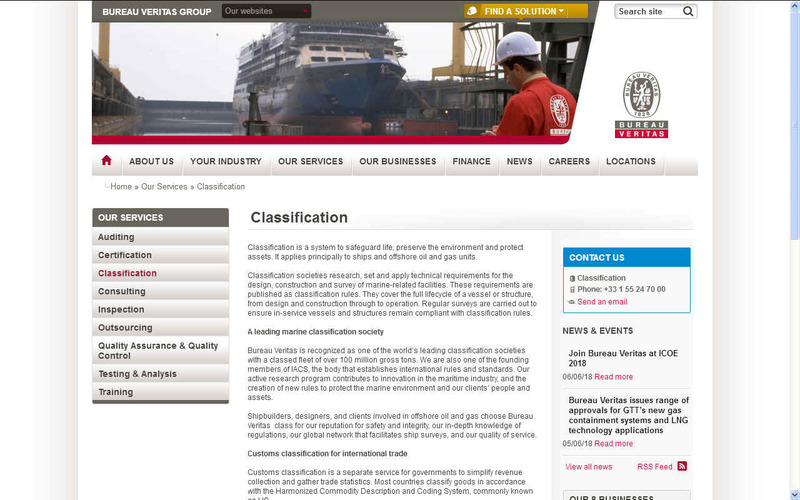 BUREAU VERITAS - Classification is a system to safeguard life, preserve the environment and protect assets. It applies principally to ships and offshore oil and gas units. Classification societies research, set and apply technical requirements for the design, construction and survey of marine-related facilities. These requirements are published as classification rules. They cover the full lifecycle of a vessel or structure, from design and construction through to operation. Regular surveys are carried out to ensure in-service vessels and structures remain compliant with classification rules. A Research Vessel (RV or R/V) is a ship or boat designed, modified, or equipped to carry out research at sea. Research vessels carry out a number of roles. Some of these roles can be combined into a single vessel but others require a dedicated vessel. Prototype SeaVax vessels will be experimental, conducting oceanographic research and surveillance generally. The object is to refine and prove the ocean cleaning concept, that also involves avoiding plankton, fish and marine mammals selectively. it may then be appropriate to assign such craft the AGE or RV code to include: O, where the vessel is a blue water, endurance machine. Hence: ORV. But where solar and wind power is a factor in the experimental stages: AGE. Clearly, the classification will change once the experimental stages are passed and ocean cleaning operations begin. If the power tonnage is 5,501 through 9,000, the first digit is "1". If the power tonnage 3,501 through 5,500, the first digit is "2." If the power tonnage is 2,001 through 3,500, the first digit is "3." If the power tonnage is 1,001 through 2,000, the first digit is "4." If the power tonnage is 501 through 1,000, the first digit is "5." If the power tonnage is 500 or less and the ship is at least 65 feet (19.8 meters) long, the first digit is "6." The second and third digits are assigned to create a unique three-digit hull number. Where SeaVax is significantly less than 500 in power/tonnage terms and may be more than 19.8 meters on the waterline, a "6" may be assigned. Where the prototype envisaged is less than 19 meters, hence no number would be included. Oceanographic research vessels carry out research on the physical, chemical and biological characteristics of water, the atmosphere and climate, and to these ends carry equipment for collecting water samples from a range of depths, including the deep seas, as well as equipment for the hydrographic sounding of the seabed, along with numerous other environmental sensors. These vessels often also carry scientific divers and unmanned underwater vehicles. Since the requirements of both oceanographic and hydrographic research are very different from those of fisheries research, these boats often fulfill dual roles. SeaVax fits much of this description, where hydrographic sounding and environmental sensor arrays are to be included, subject to suitable funding being available. Examples of an oceanographic research vessel include the NOAAS Ronald H. Brown and the Chilean Navy Cabo de Hornos. A fisheries research vessel (FRV) requires platforms which are capable of towing different types of fishing nets, collecting plankton or water samples from a range of depths, and carrying acoustic fish-finding equipment. Fisheries research vessels are often designed and built along the same lines as a large fishing vessel, but with space given over to laboratories and equipment storage, as opposed to storage of the catch. Where SeaVax will carry acoustic fish-avoiding equipment, but also seawater sampling instruments for acidity and other parameters, the vessel would be a floating laboratory. It may then be described as conduction anti-fishing, or selective fishing research. In order to avoid fish you have to be able to detect them differentially from plastic or other marine litter. Classification, is the endorsement by a classification society which is awarded once a ship meets a minimum standard in design, quality of construction. A vessel is classed in this way for a definite period of years, and on its expiry it must be resurveyed if its owners wish it to retain its original classification. Classification is then time related, it expiring, regardless of the fact that the vessel has not changed physically. After any accident such as a fire, a ship has to be resurveyed to establish its classification. The advantages for a ship owner to have their vessels classified and to keep them ‘in class’ are numerous, as the construction and maintenance of a ship up to the standard required is mandatory for almost all insurance, chartering, financing, and so on, and also for the issue of statutory certificates required by international conventions such as SOLAS. In view of the specialist function of SeaVax and the not-for-profit motives, it may benefit any international alliance to provide specialist surveys and insurance to reduce the operational overheads and streamline missions. 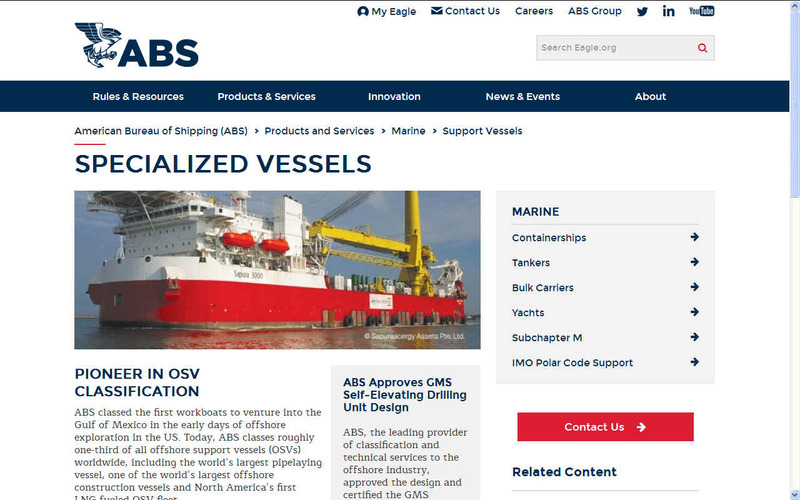 AMERICAN BUREAU SHIIPING - The heart of their classification organization, ABS Rules & Guides are derived from principles of naval architecture, marine engineering and related disciplines. Currently, ABS has more than 200 Rules, Guides and Guidance Notes available for download or purchase through the online catalog. You can search the complete current collection of ABS Rules & Guides in their database, or for older publications, search their archived database of ABS Rules & Guides. Currently, more than 50 organizations worldwide describe their activities as including marine classification, some of which are listed below. Twelve of these are members of the International Association of Classification Societies. The largest are DNV GL, the American Bureau of Shipping, Nippon Kaiji Kyokai (ClassNK) and Lloyd's Register. Classification societies employ ship surveyors, material engineers, piping engineers, mechanical engineers and electrical engineers, often located at ports and office buildings around the world. 1 = good and efficient anchoring and mooring equipment. The mark indicating that a ship has been built to Lloyd's Register class is a Formée Cross, sometimes erroneously described as a Maltese Cross. It was adopted in 1853 as a distinguishing mark for all ships built under special Lloyd's survey anywhere in the world. Currently most classification societies encourage ‘running surveys’ whereby ships on constant voyages can have inspections on a regular basis, avoiding the need for a costly lay-up every fourth or fifth year. Lloyd's Register of [British and Foreign] Shipping is a British publication that describes, classifies and registers vessels according to certain criteria of physical structure and equipment, to enable underwriters, shipbrokers, and shipowners more easily to assess commercial risk and to negotiate marine insurance rates. A classification society is, in essence, a professional third party that assures the owner or buyer of a yacht that the vessel is built to an accepted standard. A Lloyd's classified yacht is said to be Maltese 100A1, which is usually written +100A1, while ABS offers two separate designations. An ABS-classified sailing yacht is ABS Maltese A1 (+A1) while a motor yacht is termed Maltese A1-AMS (+A1-AMS), the difference being the surveying of the main propulsion system on the motor yacht, or annual machinery survey (AMS). Each of these classifications requires that a full set of plans be submitted for review and approval, and a surveyor is present during most of the construction process as well as for the sea trials. All material used in the boat is tested and, in the case of aluminum or steel yachts, each plate must have a society approval stamp and each welder must pass rigorous tests. During construction, samples of random welds will be X-rayed and, if a weld does not meet society approval, the plate is removed and a replacement is done correctly. For fiberglass yachts, the surveyor takes careful note of material storage methods, lay-up procedures, curing times, and then performs hardness tests on sample sections. Many of the SeaVax subassemblies are likely to be produced by specialist marine fabricators who will employ coded welders and work exclusively in marine grades of aluminium such as 5083. To keep a yacht "in classification," it must be inspected on a regular basis, usually annually, or whenever changes or damage to the yacht might affect the classification. For the yacht owner, it is a continuing assurance of compliance to standards and it serves as an independent check on his captain and crew, but it is not an inexpensive undertaking. For owners who simply want to assure themselves that the yacht was properly designed and constructed, most societies offer lesser ratings. The Lloyd's "Building Certificate" and "Hull Construction Certificate" do not involve ongoing classification surveys. ABS, on the other hand, offers a "Hull Certificate" in which they duplicate the classification process up to the point of delivery, at which time ABS involvement ends. Unlike Lloyd's, ABS also offers a "Plan Review" that takes the same hard look at the hull design and construction plans that they use for a full classification, but no construction surveys are performed and machinery systems are not included. Lloyd's does not offer approvals of any builder's plant, while ABS will certify a builder to be "ABS-quality." Tillotson-Pearson, for example, is ABS certified, although the yachts they produce are still carefully monitored during construction before the ABS +A1 classifications are awarded. Christiensen Yachts is the only U.S. builder of megayachts to ABS classify every yacht (except one that went with Japanese NKK society classification to that country) and they keep a furnished office for the ABS surveyor who is almost constantly on hand. Dave Christiensen estimates that the added cost is about 3 percent of the total, and probably adds 300 to 400 manhours of engineering time to prepare extra drawings and plans. A relative newcomer on the American yachting scene is Det Norske Veritas, a Norwegian classification society that has an extensive background in small pleasure boats in Scandinavia. Since 1969, the company has issued small craft type certificates, much like those provided by the American Boat & Yacht Council, in Denmark, Sweden, Norway, Finland and Iceland. These certificates assure that the craft meets certain construction and design standards of the Scandinavian countries. More than 600,000 small craft have been type certified, involving 1,300 different models from 400 builders. DNV offers the same full classification as Lloyd's and ABS and, like ABS, they offer an "Approval In Principal" of plans, which is neither a classification or certification, but simply attests that the plans meet the DNV rules, a procedure that is growing popular in Australia. The differences between the various societies in ships, where insurance is unavailable unless the vessel is classified, usually are minimal and shipowners often select their national society for ease of access and service. In yachts, however, the differences are not so clear and it usually boils down to which society will give you the best service. 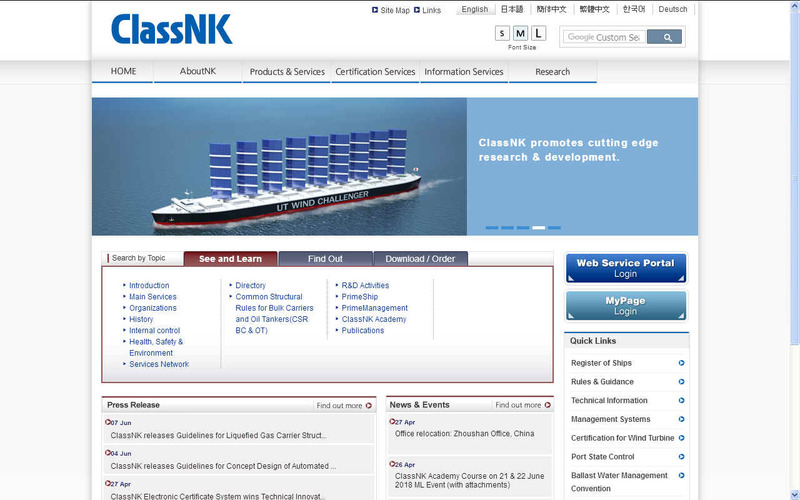 RESEARCH & DEVELOPMENT - ClassNK offers a broad range of services that encompass every aspect of ship classification from the approval of vessel and machinery plans to the survey and registration of the ship and ship installations, approval of materials, equipment and outfitting gear, as well as the assessment and registration of ship safety management systems and security systems. ABS is easier to deal with than Lloyd's if you want to try an unusual design or construction process. If you can back up your idea with facts and figures, ABS will approve it while Lloyd's tends to take a more conservative view of any deviation from the norm. ABS has made a concerted effort to reach the yachting market, and ABS representative Bob Curry worked extensively with the Offshore Racing Council's Technical Committee and several naval architects, notably Gary Mull and Olin Stephens, to devise fair and realistic scantling rules for offshore racing yachts. The result is a comprehensive guide, "Building And Classing Offshore Racing Yachts," that is both up-to-date in terms of technology as well as in a simple engineering format for designers to use. LLOYDS - Lloyd's Register Group Limited (LR) is a technical and business services organisation and a maritime classification society, wholly owned by the Lloyd’s Register Foundation, a UK charity dedicated to research and education in science and engineering. In the public mind, global shipping is all about big vessels – oil tankers, bulk carriers, container ships and cruise liners. What’s less appreciated is the vast and diverse array of other specialized vessels involved, each with a specific, vital role in the supply chains that the marine, offshore and connected industries depend on. These specialized vessels are the tugs, dredgers, bunker barges, fishing boats, high-speed ferries, offshore support and supply vessels, workboats, research vessels and numerous other types. Focusing on vessel specialization really is critical for these markets. It’s this understanding, experience and flexibility that make finding the right partners essential to operational efficiency and cost effectiveness. Classification societies exist in the shipping industry for insurance purposes to provide a uniform worldwide standard, but why is this needed in yachts where a normal surveyor could provide much the same service at far lower cost? For one thing, yachts have become small ships with all the myriad systems and complexities that would be beyond the grasp of any single surveyor and, second, with the growing variety of materials and techniques, the societies provide an information service that shares the success of certain methods and remembers the failures of others. Very few European large yachts are built without classification, simply because yacht buyers abroad are often involved in shipping, so classification is a way of life and they are comfortable with the procedures. American builders have been slow to encourage the use of classifications because buyers aren't familiar with them and, almost to a man, they all claim to build better boats than required by the societies. True or not, it is debatable as to whether a buyer would want a boat built to society standards. One well-known builder noted that it is impossible to build the high-speed motor-yachts, now so popular, to classification because of the sacrifices necessary to keep the weight to a minimum. The societies say that they have been classing high-speed patrol craft and other speed-oriented vessels for many years, and suggest that the builder is probably cutting many corners in search of an extra knot or two. Whereas the builder may simply have evolved a method of improving performance that the societies have not yet assimilated. NGAWI BEACH - This is how they recover boats on the beaches of New Zealand. It is a crude but cost effective development of trailer launching that is commendable in terms of practicality..